Post It Notes are extremely useful when it comes to remembering just what you need to do, as you can place these notes on just about anywhere. Having said that, what if you have a forgetful brain, and yet are stubborn enough not to use the memo app on your smartphone? This is where the zany looking $5.99 Check It Off Wrist Notes come in handy. 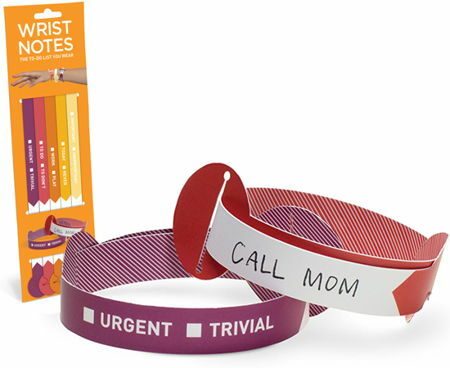 This to do list goes portable, where it will be placed on your wrist, now how about that? A simple flick of your wrist will help you classify items as Important / Unimportant, Today / Never, Work / Play, To do / To don’t, and Urgent / Trivial. There are 25 bracelets in total, 5 of 5 designs each.